August 2012: Two sisters lost their lives in an accident at Dhangali. 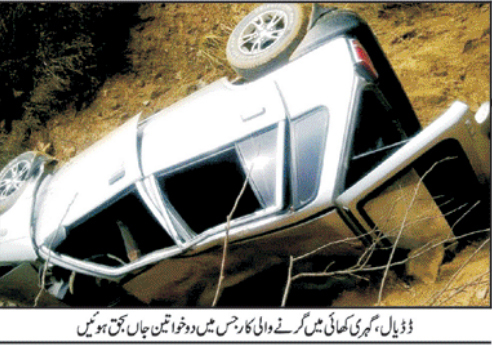 A suzuki car which was being driven from Rawalpindi to Kotli via Dhan Galli Bridge slipped due to mud on the road and fell in to a deep ditch near Dhangali. Raja Sikander Advocate was traveling with his family in the car. His wife and sister in law both died on the spot. The driver of the car and Raja Sikander Advocate suffered serious injuries and were taken to Kotli Hospital after initially receiving first aid at Dadyal Tehsil Hospital. Local Minister Afsar Shahid expressed sympathy to the victim's family on the death of the two sisters.